Every few months, we hear of a new security vulnerability and all the techies advise you to change your passwords. There was Heartbleed in April Heartbleed – What Can You Do To Stay Safe? Heartbleed – What Can You Do To Stay Safe? Read More , Shellshock in September Worse Than Heartbleed? Meet ShellShock: A New Security Threat For OS X and Linux Worse Than Heartbleed? Meet ShellShock: A New Security Threat For OS X and Linux Read More , and several others before and after. Changing passwords across the many accounts you use is a time-consuming and tedious nightmare. Good news! Password management apps are now coming up with automated ways to change your secret code across different services in a jiffy. So far, Dashlane and LastPass have rolled out this feature, but you can logically expect it to hit other competitors soon enough. I’ve Got Secure Passwords, Why Do I Need This? Even if you know how to create unbreakable, memorable passwords 6 Tips For Creating An Unbreakable Password That You Can Remember 6 Tips For Creating An Unbreakable Password That You Can Remember If your passwords are not unique and unbreakable, you might as well open the front door and invite the robbers in for lunch. Read More , it doesn’t help in the face of a worldwide security breach where you are potentially left open to having your data stolen. 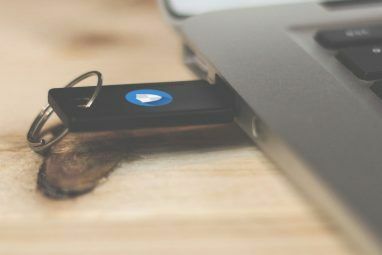 It’s best practice to have two-factor authentication (2FA) What Is Two-Factor Authentication, And Why You Should Use It What Is Two-Factor Authentication, And Why You Should Use It Two-factor authentication (2FA) is a security method that requires two different ways of proving your identity. It is commonly used in everyday life. For example paying with a credit card not only requires the card,... Read More , which requires multiple ways to log into your account. The safest option in the course of a massive breach is to change your passwords, regardless of whether you think you’re not affected. You know why? The new feature to change passwords automatically makes this action easier. Instead of manually going to each site, these apps will handle the heavy lifting and only require a click or two from you. That said, Dashlane and LastPass work differently. 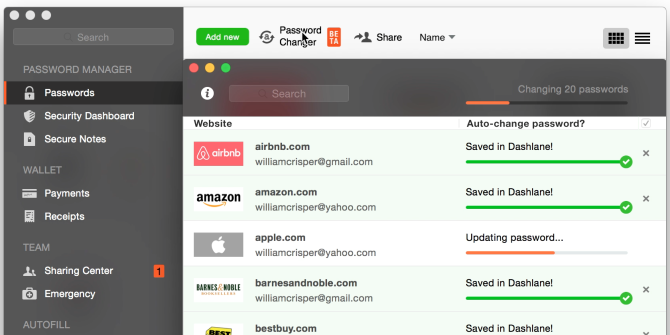 Dashlane itself is a slick password manager and online form filler Dashlane - A Slick New Password Manager, Form Filler & Online Shopping Assistant Dashlane - A Slick New Password Manager, Form Filler & Online Shopping Assistant If you've tried a few password managers before, you've probably learned to expect some roughness around the edges. They're solid, useful applications, but their interfaces can be overly complex and inconvenient. Dashlane doesn’t just reduce... Read More . But the Password Changer feature promises to set it apart from several of the other password management tools 5 Password Management Tools Compared: Find the One That's Perfect for You 5 Password Management Tools Compared: Find the One That's Perfect for You Choosing some sort of password management strategy to deal with the huge amount of passwords we need is crucial. If you're like most people, you probably store your passwords in your brain. To remember them... Read More . How does it work? This is the better of the two solutions. You’ll only have to click one button—a big green “Change all passwords”—and it will update your passwords on more than 75 sites, including Google, Facebook, Twitter, Amazon, Paypal and many more. Here’s the full list of supported sites. Dashlane randomly generates unique and secure passwords. How does it handle 2-factor authentication? “If you have two-factor authentication enabled, a pop-up will ask you for a code or for the answer to a security question,” writes The Verge. So that means you will be interacting once in a while and it won’t be all automated. 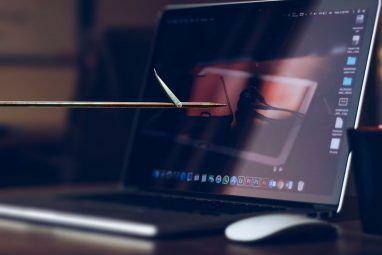 Still, it’s a small price to pay and worth it, especially since even 2FA isn’t fool-proof Two-Factor Authentication Hacked: Why You Shouldn't Panic Two-Factor Authentication Hacked: Why You Shouldn't Panic Read More . Does it support smartphones? At the moment, no. The Password Changer feature is currently available for Windows and Mac, with mobile versions coming soon. What does it cost? Dashlane is free to use for a single device. To sync it across multiple devices, you need a pro account, which costs $39.99 per year. Anything else worth knowing? In their press release, Dashlane said they will soon introduce a feature that automatically changes passwords at preset intervals. For example, a user could set Password Changer to automatically change some of their most important passwords every 30 days. Dashlane Password Changer is currently in beta. Sign up here to get access. LastPass is so good, we recommend you buy the premium version LastPass Premium: Treat Yourself To The Best Password Management Ever [Rewards] LastPass Premium: Treat Yourself To The Best Password Management Ever [Rewards] If you've never heard of LastPass, I'm sorry to say that you have been living under a rock. However, you are reading this article, so you've already made a step in the right direction. LastPass... Read More . The introduction of this new feature is the cherry on top. How does it work? Unlike Dashlane, LastPass doesn’t have a single “change all passwords” button, which means you will have to click a button for each site manually. That’s painful and hopefully LastPass solves this soon, but for the moment, Dashlane edges out. Click the “Change password automatically” button on any of 75 popular websites and LastPass will begin to automatically log you into the site in the background (in another tab) and change your password, auto-generating a secure and unique code. You can track it all through a progress bar. How does it handle 2-factor authentication? In our interview with LastPass CEO Joe Siegrist Joe Siegrist of LastPass: The Truth About Your Password Security Joe Siegrist of LastPass: The Truth About Your Password Security Read More , he advised everyone to use multi-factor authentication. Unfortunately, the new feature does not support that yet. So if you have 2-factor authentication, you have to revert to manually changing the password. Another point in Dashlane’s favour! Does it support smartphones? Nope, at the moment, it’s only for Chrome, Firefox and Safari web browsers running the LastPass extension v3.1.7+. What does it cost? 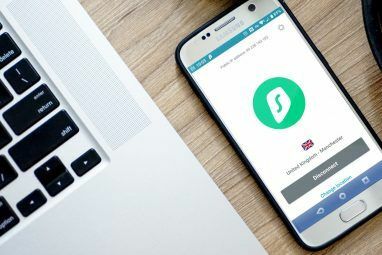 Similar to Dashlane, the extension is free but you’ll need a premium account ($12 per year) for unlimited syncing and access on phones and tablets. Download the Lastpass extension to get Auto-Password Change. Is This Just A Gimmick? Do I Really Need It? No, it’s definitely not a gimmick. Look, automatically changing passwords is not going to make you magically more secure and hack-proof. But it’s one extra security step. Think of it as another brick in your wall. Can you do without it? Sure. Does it help? Oh yeah! Planning to try these new features? Already living a password-changing free existence? Tell us all about it below. Explore more about: LastPass, Online Security, Password Manager. FWIW It is "LastPass" not "Lastpass". While it is a start, at this point in its development the Auto-Change feature is of limited use. It is great if one happens to mostly use the sites that these password managers are pre-programmed with. However, one still has to manually change passwords for the hundreds (or thousands) of sites not on the list. Of the 75 sites Dashlane will auto-change passwords for, I use only 3. Of the ones on Lastpass list I use 5 or 6. I am sure that most Internet users are in the same position as I am, they will have to manually change passwords for many, many more sites than those on the list. Until Auto-Change can automatically change all the passwords for all the sites in my Dashlane/Lastpass database, it is nothing more than a gimmick. Both Dashlane and Lastpass are working on adding more sites, so hopefully the database should grow a lot more soon :) I agree with you that it's early days and needs improvement, but it's still better than what it was before this.